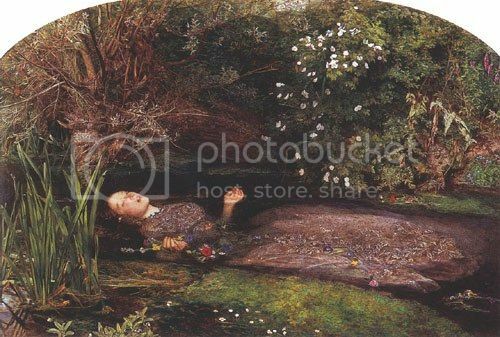 Shakespeare's heroine Ophelia placed in the most amazingly painted setting (painted by the Hogsmill stream in Surrey). Elizabeth Siddal posed for this painting wearing an antique brocade gown and laid in a tin bath filled with water. The painting was created in winter with the bath water kept warm using small candles placed underneath the bath... on one ocassion Millais was so ingrosed in his work that all the candles gradually went out and by the time Lizzie was rescued from the water she was numb with cold and on the verge of pneumonia. Like many pre-raphaelite paintings, it is full of imagery. Ophelia, rejected by Hamlet becomes quite insane and dies of a borken heart. She is shown here floating in flower strewn stream oblivious of the tragedy that awaits her and singing in her madness. Surrounded by forget-me-nots, poppies which signify death, pansies for vain love, and violets around her neck represent faithfulness, chastity and death in youth. It's so decadently dark and decaying, yet full of light and serene beauty that it amazes me it wasn't created in Venice. That a great painting. Wonderful to learn the history behind it. And I LOVE your Blog name! Fantastic post. Full of history. Thanks. Pete has posted that the BASEMENT JAM - Four hour show will be looped starting 16:00 UK time Friday 9th December. Running 24/7 until further notice. So, I suggest a Sunday chat at Ballerina Gurl's. Please let me know what you think and if you would like to join us? I will be posting the time as soon as possible. Thanks! Thank you for your sweet support and for commenting on mine! Nice to meet you! Yes I do have a journal about my grandfather as my life in general. We have a family biographer who has helped publish our families history as well as short and small books with poems and stories and illistrations as well. We are very much into genealogy as well. So hope that answered your question LOL. You are most welcome to join us to chat while watching a rerun of the Looped Basement Jam. This Sunday. I have the chatroom over on my blog and KidRic will host it for me this Sunday. Timw will be posted tomorrow when I get home from all the funeral stuff! The 4 hour Basement Jam loop is up and running smoothly. Three cheers for Rachel, Pete and the team at eelpie!! I don't know about you but I'm ready for a party! I will be hosting the "In the Basement" loop chat and be in Ballerina Gurl's chat - http://pub6.bravenet.com/chat/show.php/456044885 - around 5:15 pm eastern time Sunday December 11. I tried to base this time around the majority. Sorry if it does not fit your schedule? I have invited a special mystery guest co-host, who has excepted, and you never know who else may honor us with an appearance. The loop should start at 5:30 pm. eastern. You are cordially invited to stop by and join us. Thanks. Go to my blog and click on the Amplifier/Towser T.V. to watch the loop. It is on 24/7 every 4 hours. Great performances.